18 May 2018 Israeli artist Tamar Harpaz's show is a drama of sound and vibration unfolding from a cast of small domestic objects that have arrived here in suitcases off a plane. They are arranged at different levels, on or above a concrete floor intercut with wooden boards beneath a pitched skylight. "It's the first time i've worked in full daylight," admits the artist in an interview with Lawrence Sillars, and consequently the film noir aspect of this installation is dragged into sharp shrill day as the Psycho scream of a blue silicone disc dropping down a vertical wire pierces the gallery calm, and a rock on the floor drills out its urgent alarm while a lightbulb flashes a wan signal in a violin case. A text by Harpaz describes an anxiety dream she had that was the trigger for the work. In part of it she is being buried alive (and the metallic clip of a shovel and the falling shower of earth are heard on the five minute loop). Her mouth tastes the limestone and her eyes and ears are plugged with loam, but no one responds to her protests. Only the ground rumbles as her shouts turn into song and an ear is pressed to the soil. "In sense it's like a song..." continues Harpaz, "a repeat song." But it is also more than this. The rhyming precision with which the objects are placed in a curve round the gallery - the teacup in the shadow of a snare drum on a stool, the spoon and dangling stick at a diagonal to the suspended squiggle of the shofar horn, the panes of glass hoisted like sails above the floor in the colours of the Middle Eastern sun, the wooden post and the empty trombone, cello and violin cases - encourage you to see them in athropomorphic ways. These objects become actors in a story in which viewers are merely bystanders, wandering around them to eavesdrop on their lines. There's nothing random here; the audio sequences are artfully composed into scenes of secret rites, foreboding, warnings, hysteria, an unanswered telephone call, a crescendo of panic, all resolved with the wistful chords of a dreamy guitar. Each object is wired up as if tiny stethoscopes are attached, and the idea that they also might be listening to us, absorbing our motions and conversationg as we pass, reflects our surveillance society where domestic appliances have the potential to gather our exchanges into valuable data. 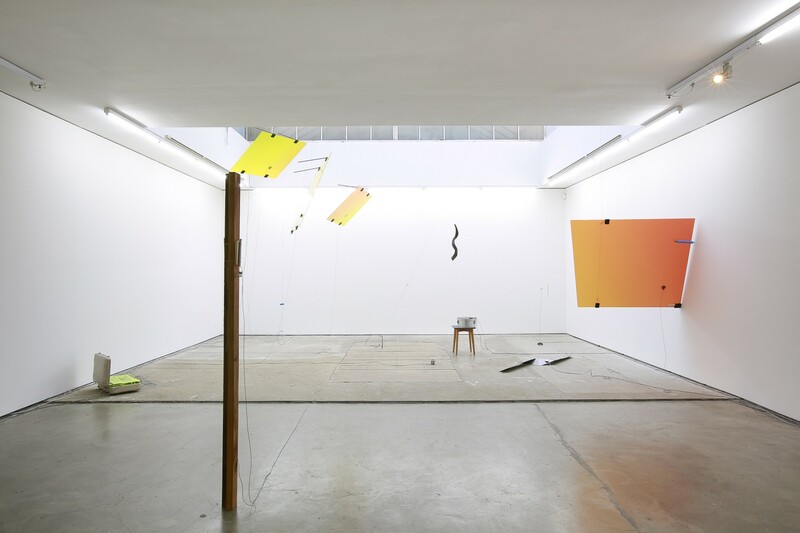 "Every object vibrates when there is a sound, and I'm trying to imagine or fantasise that you can yank out those sounds and reconstruct the history of everything those objects have heard or observed in some manner," says Harpaz, explaing the meaning behind the shows title, Crazy Delay. The loop also gives a sense of ceremony, of a repertoire of words and sounds that have existed for aeons when outside a Greek temple a goat was ritualistically sacrificed and a chant performed. Of the inclusion of the shofar, Harpaz explains: "The horn is the only thing making it's own sound... it's a Jewish artefact and used twice a year when it's blown to open the sky, so God can hear everyone's prayers... my thought was how to make the space into this theological place." I leave the gallery thinking about the excavation of sound captured from antiques like a kind of audio archaeology, but as I walk towards Tottenham Court Road I am opened up to the chaotic jumble of everyday life: the roadworks and tacky music of a souvenir shop and hum of traffic broken by a siren, the endless loop of London.